This Mud Flap is approximately 12 inches wide by 25 inches tall by 3/8 inch thick. Application: REAR of Dodge Ram 2003 thru 2009 with non-stock lift and/or oversized wheels and tires. Instructions includes. 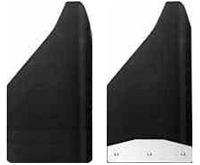 Serviceability: Best choice for mounting to the rear of any standard 2003 to current Dodge Ram Truck where our drill-less mudflaps can not be used. This Mudflap is approximately 14 inches wide by 25 inches tall by 3/8 inch thick. Application: REAR of 2003 thru 2009 Dodge Ram with extra wide tires and wheels. Mounting: Included Stainless Steel bolts, nuts, washers and self tapping screws. Serviceability: For mounting to the rear of any 2003 to current Dodge Ram truck with oversized wheels and tires. Instructions included.